All students expect access to the core text that will support their studies whether they study on campus or via online distance learning. While e-books have been a qualified success across further and higher education, how can librarians meet this expectation in an effective and sustainable way? Lorraine Estelle, Executive Director for Content and Discovery and Divisional CEO at Jisc Collections, outlined a number of institutional initiatives that are trying to tackle this dilemma at the Personalised Learning and Publishing Partnerships seminar. The national ebooks observatory project 2007-10 was established to see what would happen when all UK students had access to 36 core textbooks for 18 months. Within this limited timeframe, there was no conclusive negative impact on UK print sales. In one or two cases, print exceeded. The findings come with the usual caveats. The resulting report encouraged publishers to make all their course texts available to libraries electronically. The economist Mark Perry on the American Enterprise Institute blog in 2012 calculated the price of primary college textbooks from 812 per cent since 1972. 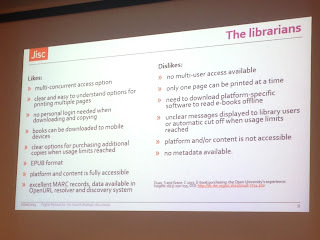 A recent report published in Insights UKSG's journal by S Duan and C Grace identified what librarians like including multi-concurrent access option, clear and easy to understand options for printing multiple pages, no personal login needed, books downloaded to mobile devices, clear options for purchasing additional copies when usage limits reached, ePub format, fully accessible platform and content, excellent MARC records and data available in Open URL resolve and discovery. When these requirements aren't met, it is deeply frustrating. Joshua Harding in a 2013 issue of Insights asked for a ebook 'study buddy' to help him with his work. Student expectation have changed enormously with advent of £9,000 per year fees. Not only students, but also parents as well. Coventry University tried to become a 'no hidden extras' university. There are a number of challenges around physical distribution. They are still persevering and exploring more e-texts. What do librarians really really want? 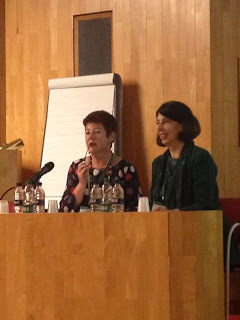 UCL Press has just been launched again with a particular call for textbooks for their open access business model. Open SUNY Textbooks is another open access text publishing initiative established by the State University of New York. Their associate provost, Carey Hatch, identified the annual cost for core texts ($1,200) as a driver. Their aim was to bring this down and save students money. Inspired by some of these projects, Jisc Collections set up the HEI as e-text book publisher project. It's aim is to provide evidence for higher education institution to assess the feasibility and economic benefits (if any) of the HEI as an e-text book publisher and to assess the impact on authors' and students' satisfaction. It will run for several years and includes the University of Liverpool, Nottingham University, University of Highlands and Islands and Napier University, and University College London. It's not specifically about open access, but a variety of business models are being explored including OA, freemium, Amazon self publish etc.